What offers a better opportunity for investment returns: low-volatility or high-volatility markets? It doesn’t seem possible that low-volatility markets might deliver better returns than the converse of more alpha being delivered in volatile markets. It defies most financial theory. We’ve always learned that higher returns require higher risk. How is it possible to get more from less: low volatility and high returns? During the past year, there have been two important publications on this topic that have received attention in the financial community: “Volatility Managed Portfolios,” by Alan Moreira and Tyler Muir (Yale School of Management, June 17, 2016), and “The Volatility Cycle,” by Charlie Bilello of Pension Partners (republished by Proactive Advisor Magazine, May 18, 2016). Both publications present well-researched and compelling arguments. The trick is to convert these concepts into real investing strategies that can be implemented on a consistent basis, in all types of market conditions. Is the issue for investors low volatility or high volatility? It can be both, but it is almost always high volatility. Price movement during low-volatility periods tends to be very orderly, until it isn’t. One type of low volatility occurs when investors are just not particularly interested in stocks or futures markets and trading volume tends to fall off. In this case, low-volatility markets would usually be accompanied by a sideways drift in prices. This behavior can be particularly true for commodities. When the price of corn is below the cost of production, investors and traders lose interest. Producers don’t want to sell at low prices and, without any expectation of a rally, prices just meander. However, strong upward price trends can also be associated with low-volatility markets. Unfortunately, in these cases, low-volatility markets over extended time periods have throughout history also foreshadowed some of the most violent and swift market downturns. We have all heard terms such “market euphoria” and “bubbles bursting.” Investor sentiment becomes overheated, markets overbought, and the last investors into the market are often those left with the most dramatic losses. Relatively low volatility in this sense can be a powerful contrary indicator of overvalued markets with exhausted buying power. Analysis of daily Bloomberg data by the CBOE from Jan. 1, 2000, to Sept. 28, 2012, showed that the VIX moved in the opposite direction of the S&P 500 about 80% of the time. This makes strong intuitive sense and was probably learned in “Investing 101.” When markets are rising, the VIX falls. When markets are dropping, the VIX rises. The key is being able to make active and tactical course changes in one’s trading strategy when a truly discernable shift in market sentiment, investor flows, and the technical trend is beginning to take shape. The Moreira and Muir paper shows that high volatility does not have a good payout; that is, you don’t get rewarded for taking more risk. My experience confirms that. I also believe it is a fundamental reason that actively managed strategies make sense for financial advisors and their clients. The financial author and analyst, Tom McClellan, recently constructed an interesting historical chart showing the relationship of the S&P 500 to the reported equity exposure levels of advisors and investment managers who self-identify as “active managers” (Figure 2). These individuals are part of an ongoing survey conducted by the National Association of Active Investment Managers (NAAIM) of its membership. 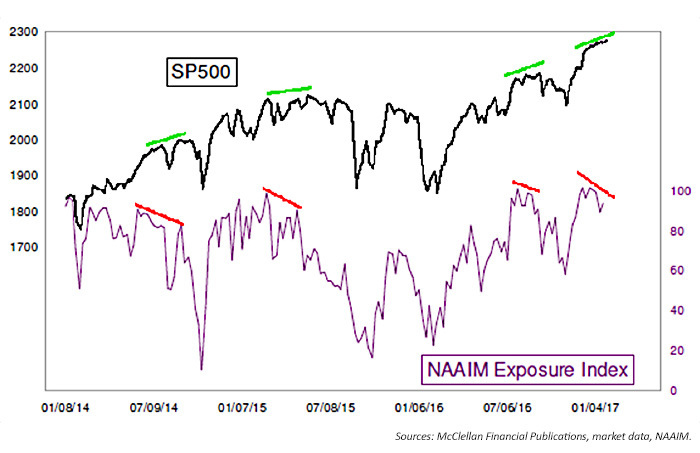 It is a very reasonable assumption that the managers who are queried as part of the NAAIM Exposure Index are primarily trend followers who try to stay out of the way of market downturns and high-volatility periods. NAAIM says, “The primary goal of most active managers is to manage the risk/reward relationship of the stock market and stay in tune with what the market is doing at any given time.” As Figure 2 shows, these particular active managers have been doing a pretty fair job of reducing market exposure prior to and coincident with market downturns and periods of higher volatility over the past few years. In my own work in futures strategies, I have found that most of the money is made during periods of low volatility, but only when you leverage up your positions to stabilize the long-term risk. For example, you set your position size in expectation of maintaining a target risk, often about 12%. That means you are willing to have a 16% chance of losing 12% (the left-tail drawdown) over the period of time you used for your calculation. That’s also a 2.5% chance of losing 24% (two standard deviations). That may be a big loss, but it is a small probability. See Related Article: Is it possible to just say no to volatility? When your portfolio volatility drops below 12% (the annualized standard deviation of the rolling returns), you increase your positon size. When it goes over 12%, you reduce your size. When you see the adjusted returns, there is a large increase during the low-volatility periods and a small decrease during the high-volatility periods. By reducing position size during high volatility, you lose a small amount of return in exchange for a large reduction in risk. So, if you are willing to give up a little return, you gain overall. Figure 3 shows a sample Global Macro Futures Portfolio, from 1988 to 2016, which trades the same markets (about 45) all the time. Without volatility adjusting, the portfolio volatility is about 5%; after volatility adjusting, it is slightly higher than the target volatility of 12%. Adjustments to the position sizes are made based on a 20-day average true range. Note that the adjustment factor, applied to the original returns, is above 1.0 most of the time, indicating that it is increasing leverage. Put another way, the initial NAVs are leveraged up based on a volatility factor that tries to keep the returns at about 12% annualized volatility. Figure 4 shows the variation in the volatility factor from 2010 to 2016. Another methodology has some advocates and addresses volatility a little differently. In order to decide that volatility is low, we look at a defined past period and decide if today’s volatility is in the lowest 20% of that period. If so, the portfolio or trading methodology is leveraged up. Calculate the daily SPY returns in the usual way: P(t)/P(t-1) – 1, where t is the current day. Choose a rolling period to calculate the volatility. I favor 20 days because that provides enough time to be responsive to market changes and corresponds to the calculation period for options implied volatility. Find the maximum and minimum volatility over the same 20-day period. If today’s volatility is T or lower, we trade the entire investment. If not, we trade 50% of the investment. Indeed, emphasizing low volatility returns improves the risk ratio, but at a cost to the returns. That is because we are fully invested only 20% of the time. Unfortunately, the improvement in the risk ratio is only modest. Note that “risk” is the annualized volatility, the standard deviation of the monthly returns times the square root of 12. The “information ratio” is the annualized rate of return (AROR) divided by the risk. However, this trading methodology can be significantly enhanced by changing the volatility threshold to 75%. By that, I mean trade all of the strategy investment unless the volatility is in the upper 25% of a given time period. That means we’re eliminating high volatility more than we are emphasizing low volatility. We are also using more of the investment more of the time. The results are shown in Table 2. The adjusted returns are about 0.5% better annualized, and the information ratio is 0.36 instead of 0.30. So, we get higher returns and lower risk! Just what the doctor ordered. In looking at backtested results during the credit crisis of 2008, the maximum drawdown for this methodology was at 43%, versus a non-volatility-adjusted SPY drawdown of 51%. With some further refinements of the methodology, this still-too-high drawdown could likely be made far more favorable. The overall point is demonstrated in the data: avoiding the highest volatility periods can represent a tactical, active strategy that delivers better returns, lower risk, and less severe drawdowns during the worst market years. To my way of thinking, reducing high volatility is a win-win situation. 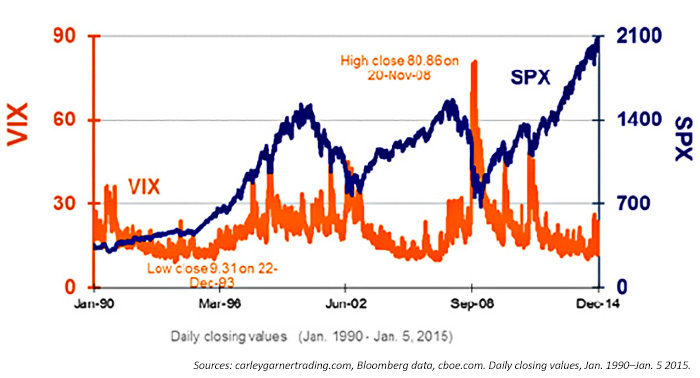 High volatility means high risk, even when it does not manifest itself in the market. My experience is that the returns during high-volatility periods do not come close to justifying the risk. A low-volatility trading strategy, especially one that incorporates leverage, can be a tactical approach to the markets with many benefits. The very high returns of a blockbuster market year may not be attained, but, in general, more consistent, lower-risk returns can be achieved through different market cycles and a variety of volatility environments.